Karim Benzema in line to replace Luis Suarez? 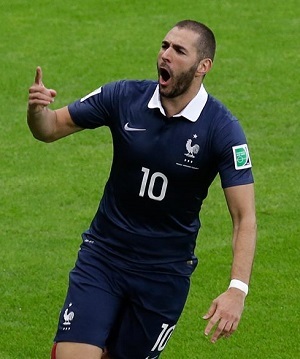 Benzema scored 3 goals in the 2014 World Cup. Karim Benzema was already an established international soccer star before the World Cup, having helped Real Madrid (Spain) to UEFA Champions League and Copa del Rey championships. But his performance in Brazil for Team France really drew the world’s attention to the French-Algerian Muslim striker, and could lead to more lucrative opportunities. Stepping up when French star Franck Ribery (also a practicing Muslim) went down with a back injury, Benzema had three goals and two assists during the World Cup as France advanced to the quarterfinals before losing to eventual champion Germany. The 26-year-old Real Madrid star is an aesthetically pleasing player on the eye, gliding gracefully across the pitch with an elegance not dissimilar to former Liverpool striker Nicolas Anelka. He is a strong finisher, has underrated pace and can link up very well in a front three which would appeal to Rodgers. His form at the end of the campaign alongside Cristiano Ronaldo and Gareth Bale as Los Blancos won the Champions League was terrific. 17 goals in 35 La Liga appearances for the Spanish giants is a good, if not spectacular, return, and while he may lack the genius of Suarez, he is a hugely talented footballer in his own right. 192 goals in 403 career games is very impressive. Do you think Karim Benzema is as good as (or better than) Luis Suarez?